Be ready for accountant interview questions that explore the candidate's knowledge, skills and core competencies commonly required for successful performance in an accountancy job. These are the typical accounting behavioral interview questions you can expect in your next job interview. Be ready with convincing behavioral examples to demonstrate that you have the right accountancy job competencies. Initial interview questions will evaluate your understanding and knowledge of accounting practices. Accountant interview questions around the technical and knowledge requirements are generally answered by reviewing your resume as they refer directly to your qualifications, your training and your work task experience. "How have you implemented the recent tax changes in your company?" "Detail your experience in preparing management accounts." "Explain the different accounting packages you are familiar with and tell me which best met your needs." The interviewer will use questions that look for evidence of accountancy-related competencies. You will be asked to provide specific examples of when you have previously demonstrated the required competency. These are called behavioral interview questions. Go through these accountant interview questions that explore the core competencies required for successful job performance. Use the answer guidelines to help you prepare your own excellent answers. "Tell me about a time you handled a complex financial project with a tight deadline that required precise data collection and analysis." "Give me an example of how you keep track of things requiring your attention." "What work objectives did you set for this year and what steps have you taken to ensure you will achieve them?" In your answer show how you are able to develop specific objectives and plan and prioritize systematically to accomplish these objectives within set time frames. This includes scheduling, identifying and allocating resources and the use of appropriate organizational tools. "How have you monitored the regulations that affect your accounting position?" "How have you monitored the performance of your team?" "Describe the systems you have in place for keeping track of assignments given to staff members." In your answer discuss how you have set up effective procedures for information collection and review. Describe how you monitor projects and check the progress of delegated tasks. 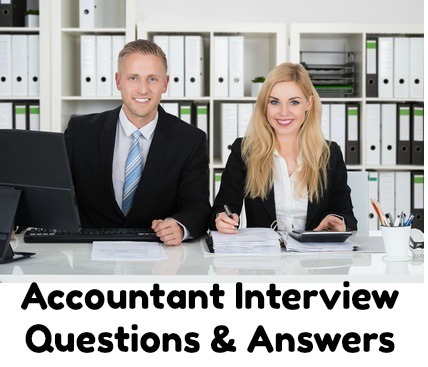 Accountant interview questions will also focus on your ability to analyze and assess problems. "Describe a recent tough financial analysis problem you faced on the job." "Take me through your latest budget preparation." "How have you managed potential payment problems with your customers?" In your answer show how you are able to identify key issues and detect problems from relevant information, include your ability to break down and organize information to recognize cause and effect relationships. "What has been the most significant decision you made at work this year?" "Tell me how you reacted when someone else's errors were impacting negatively on your job." "Describe a situation in which you received instructions with which you disagreed." In your answer discuss how you are able to determine an appropriate and effective course of action based on factual information, accurate assessment of organizational resources and consideration of the alternatives. Describe how you communicate your decision to others. "How do you control errors in your work?" "Give me an example of when you were not happy with the details of an established procedure and what you did about it." "Describe the criteria you use for evaluating the reliability of the financial information you receive." In your answer demonstrate your willingness to pay attention to all aspects of the job, no matter how small, to check outputs for accuracy and reliability. Show how you set high performance standards for yourself and others. "Give me an example of when you had to explain a complex process to staff members." "Tell me about a time you had to communicate an organizational change to your team." "Describe a time that you had to present financial data to non-financial staff." Be well prepared for these interview questions and stand out as the right candidate for the accounting job opportunity.